Feeding mind, body and soul. That's the fabric of the Daphne's experience. And it's where we've landed after completely re-envisioning our menu, our look and our culture. The new Daphne's is a refreshingly new dining experience that stems from real integrity found on our menu, in our stores and in our communities. We've taken our inspiration from people who live actively ' and actively live. 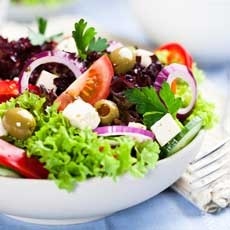 At Daphne's, we offer fresh, high-quality and healthful food without compromising great taste. We've added a dozen menu items that build on a 'California-fresh' ideal with savory, rich and robust Mediterranean undertones. Enjoy a full menu of specialty salads, flatbread pizzas, pita sandwiches and grilled meats and seafood complemented by flavorful sides such as a spicy Fire Feta ® dip, roasted veggies, and tabouli. We've even crafted an original recipe for our new multigrain pita bread containing seven whole grains. And indulge in the freshness of Daphne's with salads prepared to order, kabobs hand-made daily, lean meats and seafood grilled to order, and gyro meat that is slow-roasted on our rotisserie. Best yet, many of our menu items fall under 700 calories and can be customized to accommodate low-fat, low-carb, high protein diets as well as vegetarian, vegan and gluten- free diets. Through in-store signage and easy-to-read nutritional guides at every register, we've made it easy for you to make health-conscious choices at all of our restaurants.